Calm down! Let's get organised! How good is the feeling of a clean and organised desk! What about the cloud-nine feeling when all the filing is done – properly! So many of us struggle to keep our office space in order, whether you are a small business working from an office or a little study nook at home. There are many reasons for this. Perhaps you don’t have the time. Perhaps there isn’t a place for everything and therefore nothing is in its place! Where do you start? The thought of organisation can create a wave of anxiety and prevent productivity. This is why Geelong’s Next Level Accountants has teamed up with A Place of Calm to bring you a workshop to help small businesses achieve an organised workspace and increase their productivity! Learn how to improve the flow of your office, discuss productive desk organisation and how to efficiently file your soft-copies in this workshop plus so much more! This workshop is perfect for a small business located at home or an office! 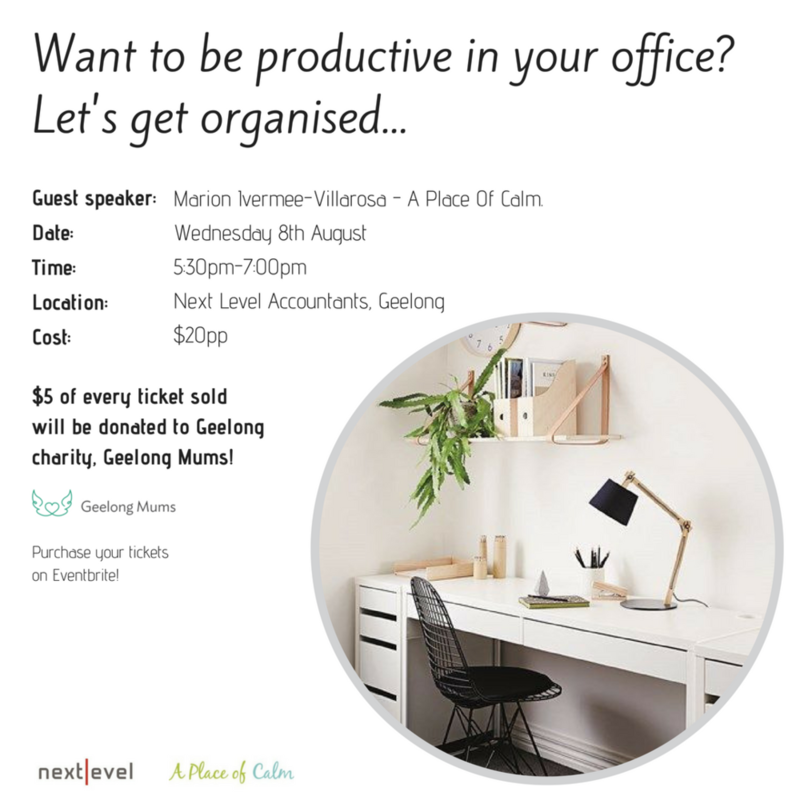 We are excited about this event, not just to get you and your office organised, but we will be donating $5 from every ticket to the Geelong charity, Geelong Mums which is a fantastic cause helping struggling mums and bubs around Geelong!. To view our Facebook event, click here.